Name Your top 10 weapons in the Duke Nuke Series "Top 10 weapons in the Duke Nukem Series"
Here Are My Top Ten Weapons In The Duke Nukem Series. So did he fire six or five rounds, Or Five? The Peacekeeper Revolver, the weapon that won the west. It held six rounds and dropped anything in front of you with one-two rounds. It made its debt in Zero Hour's Wild West Era, as an 1860 Colt Conversion. The Revolver had an air of refinement, in an uncivilized age. It demanded good judgement and careful aim for the greatest success. It was high damage and low capacity weapon what made it high risk high reward, but the consistency of power was undeniable when in the heat of combat. Imposing when held, and made bosses reel back when hit. Like the saying goes: Six bullets, more than enough to kill anything that moves. If there was one weapon I want retuning it would be this weapon. This deserves the first slot in my list. Wheel-gun, hand-cannon, man-stopper. What if you combined a mini-gun with a rocket launcher? Well you get the Devastator. This four barreled machine gun rocket launcher is insane by design. It consumes ammo like nothing I have ever seen, but it will always guarantee whatever is in front of you will die within mere seconds. The ammo was rare, and it made you covet every box of rockets. It was a Boss-killer. This gun was outright overkill. What if you combined four shotguns at once? Well you get this beast. The normal shotgun gets you far, however what if it had four smoking barrels? This Shotgun chews through ammo like nothing; and makes aliens become Swiss cheese. Four bullets per shot and was insane in terms of recoil. You got this gun when you were in the Australian city of Sidney and it was a shocker when you got it. It was gross to use, but satisfying when you heard the kitchen timer ‘ding’ sound. The Expander was a joke weapon, for the most part. This was a modification of the Shrinker. It expanded molecules till the point of bursting. It was an odd weapon that often resulted in hilarious deaths. In the Wild West Era, this gun was a workhorse. It had the range, the rate of fire, and the accuracy that made it a jack-of-all trade’s weapon. Stylish ion design and execution as every time you reloaded the weapon you twirled it. A secret weapon from Time to kill. In order to earn this weapon you had to fry 80 chickens with it. It was funny as well as deadly. Squeeze the trigger, wait for five seconds, and leg go. The plasma cannon was an awesome weapon that cleared rooms once charged. It fired mini-stars that once it the enemy, results in a supernova. The bullets were next to non-existent. It made its debut in Zero Hour as the BMF Thunderstrike where you had to scour secret areas to get this weapon and it only game with 3 shots. 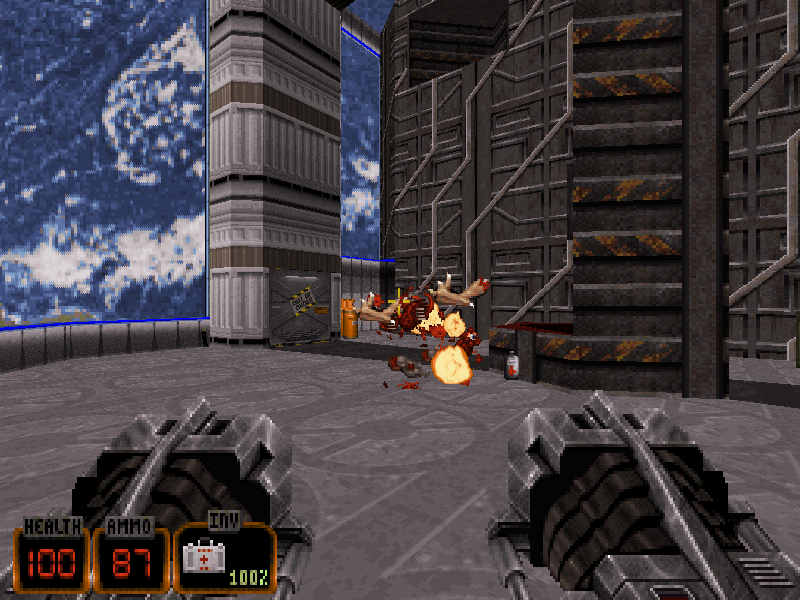 In Duke64 it was a prototype weapon that was unreliable, but it was a high risk high reward weapon. I know what you are thinking: The pistol? Out of all weapons why choose this one? Let me explain. When I first played this game I looked at the achievements, and one of them was called: Gunslinger. Where you had to carry this pistol throughout the game. I played the entire game on hard with this pistol and gained the achievement. This gun never failed me. Ammo was plentiful and could be the most powerful weapon in the game as it did quadruple the damage if you scored a headshot. This ivory handled, gold-plated pistol was a customized to fit Duke’s personality. It was iconic and easily recognizable. This was an insane weapon. It was so overpowered that you had to play the game on Hard difficulty and collect all the nukes to get it. A lightning weapon that shocked all, and would chain lighting to other enemies. What if an icebox had a trigger? You’ll get this weapon. The Freezethower was a strange weapon that made its debut it in the Lunar Apocalypse episode in Duke 3D. It froze aliens in their tracks and made them brittle as glass. Ammo was seldom seen but when you got ammo to spare it stopped all but the toughest aliens in their tracks frozen solid. #1. the Pipebomb, so fun and nothing quite as good as the feel it has in another game I can think of. #2. the shotgun, fun to use. #3. the mighty boot! Especially for speeding up killing Liztroops while also shooting them with a pistol etc. #4. the RPG, just feels better than most other rocket launchers. #6. shrink ray - original and excellent. #7. pistol (Duke 3D or DNF variety), Duke has a better starting pistol than any other FPS protagonist I can think of. Always a solid choice. Akimbo pistols in Zero Hour is also cool. #8. SMGs from Duke Nukem 64. Ripper is groovy too, but I dig those SMGs. #9. Railgun (DNF). Sniping may not be the most Duke of strategies, but I like the feel of this one. Honorable mention: Duke's razor sharp wit! 1. Shrinker - Various - There's something satisfying and hilarious to shrinking aliens and stepping on them. Steroids I keep around for when it's me who gets hit. 2. Expander - Duke Nukem 3D/64 - The expander is fun along the same lines, where enemies grow and explode into gibs and damage nearby enemies. The 64 version gave it the kitchen timer ding to increase amusement. 3. Freezethrower - Various - Another kind of novelty weapon, freezing and shattering your enemies is fun. 3. Laser Gatling Gun - Time To Kill/Land of the Babes - A rapid-fire laser gun. Fun to use and see and enemies don't stand a chance against it. 4. 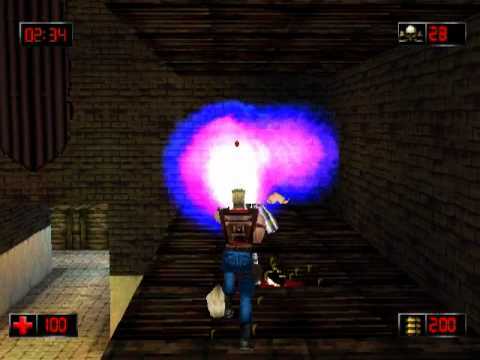 Grenade Launcher - Duke Nukem 64 - Something that is probably more interesting than the RPG as you can shoot grenades into rooms and obliterate everything without having to be exact with aiming. 5. Devastator - Various - It never takes much from it to clear a room of aliens. Octabrains, which take 3 shotgun blasts in Duke Nukem 3D, are killed instantly. 6. Pipebomb - Various - Endlessly useful, they can be used to set traps, destroying things at a distance, or in a pinch, tossed and blown up in your foe's face. 7. Railgun - Duke Nukem Forever - I don't think I've encountered a railgun I didn't like. Sniper weapons are always good. 8. Enforcer Weapon - Duke Nukem Forever - Given a little time, they will do the finding and the exploding for you. 9. 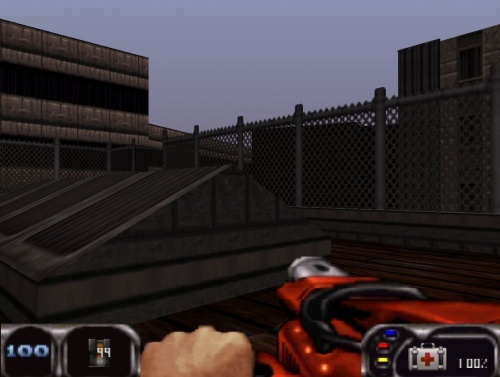 SMGs - Duke Nukem 64 - Rapid fire hitscan weapons that had more character and felt cooler than the Ripper. 10. Pistol - Various - In Duke Nukem 3D, as long as you're aiming at an enemy, the gun has no spread, which makes it useful over crazy distances, like shooting troopers out of the air, which is always fun. 1 - Shotgun, powerfull and reliable. 5 - Lead (Quad) Shotgun - When you need to get up close and personal, no better weapon than that. Hmm, This one is a tough one for me. I've enjoyed pretty much every single weapons in the Duke Nukem games. Either way here is my top 10 weapons in Duke Nukem. 1. Shrinker/Expander (DN3D) - It's always fun to shrink the aliens and step on them, As well as to watch them grow and blow up into millions of pieces. 2. 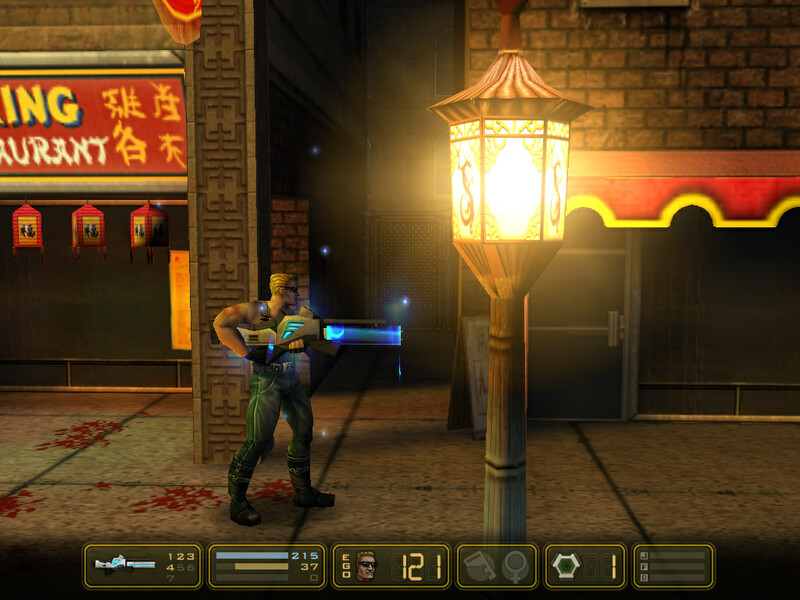 Shotgun (DN3D) - This weapons is very reliable for me in Duke 3D. It's fun to shoot enemies in the face with this weapon. 3. Laser Gatling gun (DNTTK) - While the normal Gatling gun in Time To Kill is pretty good on it's own, but when upgraded into the Laser Gatling gun, it becomes an awesome weapon. I loved using this weapon as a kid since it fires lasers. 4. RPG (DN3D) - There's nothing like blowing up a group of enemies with a single RPG rocket. 5. AGL-9 Grenade Launcher (DNZH) - Always my preferred weapon in Zero Hour. Shooting grenades around corners to blow up unsuspecting enemies. 6. Golden Pistol (DNF) - Ever since I've gotten the gunslinger achievement/Trophy in Duke Nukem Forever, This weapon was pretty much reliable for me. 7. Railgun (DNF) - This weapon is fun to use, since you can snipe enemies from a distance. Also getting head shots with this weapon will make enemies heads grow until it explodes. 8. SMG (DN64) - Two guns are better than one. These weapons are pretty cool to use. 9. Freezer (DN3D) - There's nothing like freezing your enemies, and then shattering them into little pieces. 10. Enforcer gun (DNF) - It fire three blue heat seeking rockets. The Mighty Foot (DN3D) - Kicking enemies in the face is always fun. Pipebombs (DN3D) - Very useful for surprising enemies, and blowing up cracks in the walls. Holy Hand Grenade (DNTTK) - Cause why not. I like this list. It is really through. I never knew that it was Duke64 that adding the kitchen timer ‘Ding’ sound to the expander. I guess it was the one thing that disappointed me about the PC version. It’s the little things you know that add to the weapons charm. I added a list of ten weapons for some wiggle room. By adding a large list makes the person think of those memorable weapons in the franchise that were extra special. If you think about it, Duke Nukem and the weapons are what make the game fun, it is a cog in the wheel. Same thing goes with the levels. Is it just me or is it that Zero Hour had the most memorable weapons in the series? No matter whom I ask they always go back to Zero Hour for the most inventive weapons. I mean next to Manhattan Project where can you say you had a gun that shoots lighting at enemies. Or the Peacekeeper Revolver making enemies fly back in hilarious ways. Of course the other games have their memorable weapons but Zero Hour is often mentioned a lot. I've mentioned it before, but ports of Time To Kill, Land of the Babes, and Zero Hour to PC would be a huge treat I think. I'm going to boil top 10 to one single weapon. That weapon is the Ripper, that 3 barreled, ammo eating, bullet vomit gun that I always make sure to have in my inventory. I love the design, the damage it does, and the sound it makes when it fires. Now if only a 6 barreled version existed. Now if only a 6 barreled version existed. That already exists, it's called a minigun. 7 - Mightyboot (Duke3D) - I mean, wasnt Duke3D first game with quick melee key? And who could forget bicycle kicking enemies to death? 10 - Slimers (Duke3D) - When I see foot based enemies near eggs, I never break them. Just let them do their work. And bonus position goes to worst weapon ever - Expander - It was nice idea behind, but final realisation was very lacking... What is the point in using weapon that almost takes more rounds to kill basic monsters than pistol? It's such a fun concept. The hitscan properties make it quite easy to handle too. Always reliable. While it's great to clear out rooms filled with hitscan enemies like Pigcops and Enforecers, I personally love it because it deals with Slimers and their eggs. The DNF version over the DN3D one because DNF's feels heavier and more powerful despite being slower and having less ammo for the sake of a 69 joke. It's the best of the non-Impregnator alien weapons. Burst-fire homing rockets never cease to be helpful, and the blue fire SFX is an eye-pleaser too. Feels heavier and more powerful despite being slower and seemingly clunky and impractical. It tears through Troopers and everything in LameDuke. The plasma ball sprites are cool. What's even better is that in a D3D95 video, it has a an alt-fire where it becomes a spread shot. Talk about overkill. It's great to bounce these things off walls. DNF version is clunky and useless. You can boost yourself up in the air with this. The one in D3D95 and World Tour looks great too. This is the sole reason why I never had any issues with Assault Commanders. I know the Ripper is more iconic, but I personally liked the dual SMGs because Duke looks cooler with modern weapons instead of space age ray guns.